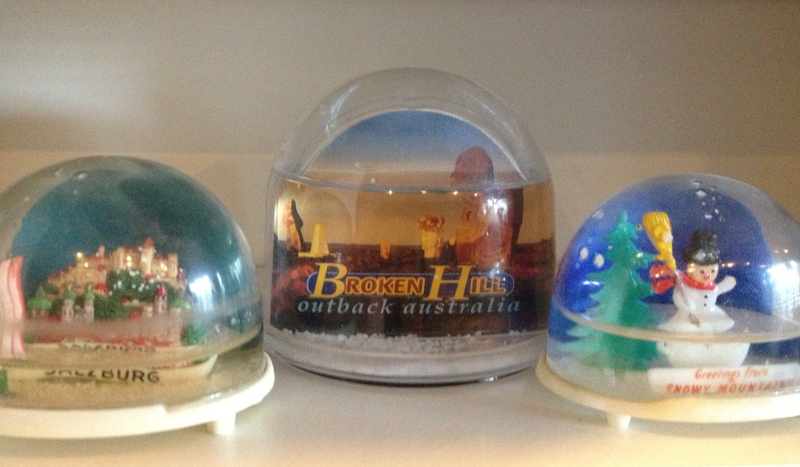 I was amused when a friend gave me a snow dome as a souvenir from Broken Hill years ago. I have never been there myself but I doubted whether it had ever snowed in the ‘Capital of the Outback’. This mining town is in New South Wales’ arid zone, around 1100 Km west of Sydney. It is surrounded by semi-desert that was featured in great Aussie films like ‘Mad Max’ and ‘The Adventures of Priscilla, Queen of the Desert’. Dust storms and heat waves are far more of a problem. A travel article last year referred to the town itself as a ‘snow dome’ – but this was because it is ‘a bubble of a town in the middle of nowhere’ (not because of the climate). Apparently the shop owner thought his wife was mad when she ordered the snow domes – my friend said he was told this was the first one they had sold. ‹ Can cricket jargon help to create a better and more inclusive Australia? If they hadn’t leaked then you would now be deliberating about whether to keep them or not! These are the only ones I have – all cheap plastic ones. I didn’t buy any of them – but maybe I will start a collection from places where it rarely snows. Hullo Pip, Broken Hill is a facinating town. I have camped in the Caravan Park one October and gone through by train in December and January. All pleasantly warm months and balmy evenings to stroll around the shopping areas to buy fresh fruit for nibbles during travelling. The highlights of the town are it’s extremely wide streets, (for donkey drays etc.) and the multitude of hotels down the main street to quench the miner’s thirsts. Then of course we must not forget Pro Hart’s multicoloured outstanding home in the southern end of town. Broken Hill is like an oasis of civilization set in an endless plain of spinifex and saltbush. A facinating place to visit. Maybe someone could start an Australian business making dust storm domes. I reckon Uluru in a red dust dome would be a best seller! That would probably work well for Broken Hill as well. You may be onto something!